Born in the night from Good Friday to Holy Saturday. She was the firstborn of 11 children of the tailor Ferdinand Neumann and his spouse Anna, born Grillmeier. Therese grew up in modest circumstances. Her life was limited to the work in the house. There were not much opportunities for children games since every child had to help on the small farm of their parents, in the tailor shop and in the household as far as their capabilities allowed. The education which the parents bestowed upon their children was strictly Christian. Therese submitted herself voluntarily and willingly in this strict, but kind education. From 1904 - 1911 she attended the elementary school. She was said to be an eager and good pupil. The low income forced them to pay attention that the children earned money at an early point in time to contribute to the maintenance of the family. Thus Therese had already taken employment at the castle Fockenfeld in the afternoon in the last half-year she attended the school on working days (1910-11). At the age of fourteen (1912) she also started a work as maid full-day on a large estate in Konnersreuth. Therefore, she was only able to attend the Sunday school from 1911 to 1914. She had good and very good marks in the school leaving testimonials for her subjects religion, science instructions, reading, arithmetic, essay and calligraphy. Therese was a bright, healthy child. During school years, there was nothing unusual. She was known for her character full of the joys of life and showed responsibility at an early stage. On 12.07.1908 she was confirmed in Waldsassen by the bishop Antonius von Henle of Regensburg. She received the first communion on 18.04.1909. 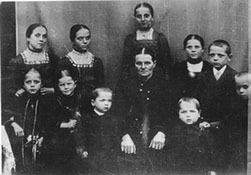 After having completed the elementary school, Therese decided for the profession as missionary sister and got in contact with the Missionary Benedictines in Tutzing on the Lake Starnberger 02.02.1912. An entering the holy orders requires, that she would bring along a trousseau. She saved it beside the contribution to the livelihood for the family with the remuneration at the farm of the big farmer Neumann (not related with her own family) in Konnersreuth. Besides the agricultural activities, the estate owned also a restaurant. Therese helped in the restaurant, however, she mainly looked after the cattle and the field work. The war prevented her from entering the holy orders. When father Neumann was recruited for military service in 1914, she promised her parents to wait to enter the monastery until her father would have returned from war. 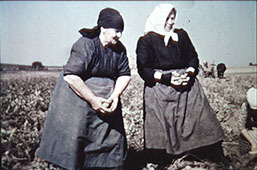 When the owner of the farm was recruited for military service in the First World War, Therese assumed the role of the foreman. Due to her unusual physical strength, the works on the farm and on the field were an easy task for her. She loved plants and animals, the change of the seasons as well as natural phenomena. 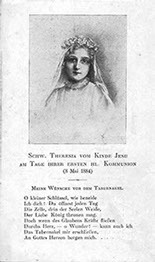 Father Ferdinand brought a devotional picture of the French Carmelite Therese of Lisieux (Thérèse Martin) for his daughter during a home leave in the First World War. Thereupon, Therese who was 16 years old became interested in the biography of the “Little Therese”, adored her and prayed for her beatification. On 10.03.1918, a fire broke out on the estate of the blacksmith in Konnersreuth. Therese hurried to the scene of fire and saved the animals from the stable. Since the flames also spread on the adjacent estate of Therese’s employer, she joined the fire-fighting operations. Being one of the strongest persons who stayed in town, she lifted the fire buckets on the attic of the barn while standing on a stool. When she wanted to lift another bucket after two hours of lifting activities being completely soaked, a stabbing pain traversed her back. She was only able to move on bent over and in a great deal of pain. Neither the relatives nor the employer attached any particular importance to the accident at work. In spite of the persistent back pain, she also did not spare herself, but felt obliged to return to work quite soon. Due to physical overexertion, other more severe accidents followed during the same year. When she wanted to get a sackful of potatoes from the cellar at the beginning of April 1918, she collapsed on the stony cellar stairs. She hit down with the back of the head and remained there unconscious. In the sequel she constantly had headaches, anyway she had difficulties in walking, furthermore she was unable to control the bladder and intestinal functions any longer. The doctor, Dr. Goebel, diagnosed a stomach lowering and transferred her to the hospital of Waldsassen on 23.04.1918. She left hospital on 10.06.1918 without being cured. On 01.08.1918, she fell off a ladder while transporting sheaves. Again, she had a spasm in the back and remained there unconscious. The present symptoms intensified, furthermore, she had sight disorders. She was forced to rest in bed for a while. As soon as she tried to make herself useful and to assume works, other accidents happened. On the day before the church consecration festival on 22.10.1918, when a lot needed to be prepared in the Neumann’s restaurant, she fell from the ricks to the floor. Subsequently, her vision and her walking reduced to a minimum. After a viral infect a little later, her physical strength completely disappeared. She was completely paralyzed and became bedridden. Painful cramps of different muscle groups affected her and due to nerve inflammations, her sense of touch was considerably reduced. She had become a nursing case and as such, she was completely depending on the help of her family. Several doctors, orthodox medical practitioners as well as naturopaths treated her, but her conditions didn’t improve. In March 1919, she had cramps in the trunk, when she sat on the invalid chair. She fell off the chair, and again hit her head and remained several days almost without consciousness. When she became conscious again, she went blind. A little later, she became temporarily deaf. Thus, Therese was completely helpless. 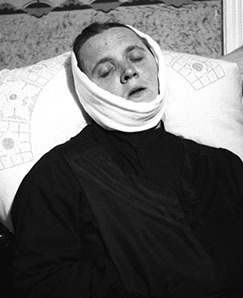 Disturbances of nutrition already arrived to Therese from her first accident in 1918 on. When she suffered from severe throat disorders at Christmas 1922, she was unable to eat solid food from that time on, but only food in form of mash and tee. On 29.04.1923 when sleeping, she had the impression that something would scratch on her pillow. She woke up and suddenly she was able to see. The recovery did not only surprise herself and her family, but also the doctors, particularly since her loss of sight more than four years ago, different traditional as well as empirical medical treatment methods had been applied, which had been unsuccessful. However, the other sufferings persisted. On the day of the recovery, the beatification of Therese of Lisieux took place. On 17.05.1925, the day of the beatification of Therese of Lisieux, Therese was found in her bed, unresponsive, the eyes fixed to something in front of her, the hands stretched out to it, with a happy expression. She nod and shook her head, as if she would talk to somebody. Suddenly she sat up, even with severe pains at the injured area of her backbone. When she was responsive again, she explained what has just happened. It suddenly brightened up before her eyes and a female voice asked her if she wouldn’t like to recover. She answered, that everything would be right, recover, remain sick, die, if God would like it. Thereupon, the voice meant to her, she should now experience a joy and be able to stand up and walk. However, at the same time she announced lots of other sufferings to her, but she would always help her, as she did up to now (cf. Naber, p. 12 ). After six and a half years of paralysis she was now able to move her legs and walk without the help of others. On 30. 09.1925, the day of death of Therese of Lisieux, the beautiful light appeared again to Therese and the same voice explained, God wanted that Therese should be able to walk without the help of others. And thus it was. 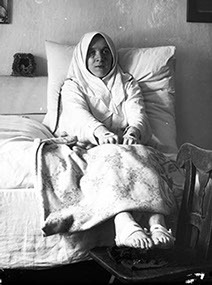 On 07.11.1925, Therese again suffered from severe pains. The doctor called on 13.11.1925, Dr. Seidl, who treated Therese since 1919, diagnosed acute appendicitis and urged to immediately operate. While he still prepared the operation, the family prayed to Therese of Lisieux. The voice appeared again to Therese, announced her immediate recovery without operation and demanded the sick person, to get up immediately, to go to church and to thank to God. She was indeed able to go to church, all pains and the fever suddenly disappeared. Shortly before carnival, on 16.02.1926, there was a new decisive point in Therese’s life: She fell ill again, furthermore she had an abscess in the ear and occasionally blood serum and pus seeped from the eyes. Many a time she laid sleepless in her bed, among others also in the night from Thursday, 04th to 05.03.1926, when she suddenly had a historic vision. She saw Jesus kneel in the garden of Gethsemane. At the same time, she felt a pain on the left side of the breast of such an intensity, that she thought she would die. Then, blood streamed in this area. This streaming blood continued until the following noon. This vision of the suffering and dying of Jesus repeated for 36 years until her death in more than 30 individual visions each on all Fridays, except for those at Christmas until Lent and from Eastern until the Feast of the Sacred Heart as well as those, which coincided with an important feast day or a festive octave. “Thereby the eyes, the heart and the head bled; during the Lent also the feet, knees and hands as well as the right shoulder, on Good Friday moreover the breast and the back” (Rössler, p. 21). The stigmas on the heart, on the hands and feet always remained visible, they were never inflamed nor did they suppurate provided that they were not treated with medication. On Christmas Eve 1926, she experienced for the first time another vision than the passion. She saw the transfigured Infant Jesus. In 1926, another phenomenon took place, the fact that she did not eat anything. 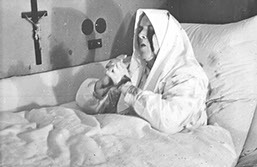 As already mentioned, Therese was unable to eat solid food since Christmas 1922, but only soft food and liquids. On Christmas 1926, also her digestive tract no longer accepted this food intake. Solely swallowing became impossible. When she was asked, from what she lived, she answered, that she lived from the daily Holy Communion (cr. Rössler, p. 21). The events about Therese could no longer be hidden in privacy. They awakened the interest of the public and attracted enormous streams of visitors, in particular on Fridays. The bishop of Regensburg, Antonius of Henle, preserved great restraint towards the events in Konnersreuther up to now. With respect to the more and more turbulent public discourse the Bavarian Bishops Conference considered it appropriate, to create a scientific basis for the philosophical-theological examination of the phenomena. 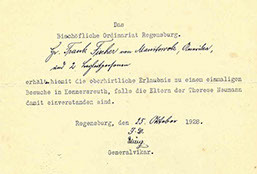 Therefore, Therese was submitted to medical examinations under the control of Dr. Seidl from Waldsassen and Prof. Dr. Ewald from Erlangen from the 14th to the 28th July 1927 by order of the episcopal ordinariate in order to examine in particular the phenomena of the fact that she does not eat anything by observing her weight, temperature, pulse values as well as by laboratory examination of her excretions and blood. Four sworn nurses of Mallersdorf watched Therese without interruptions upon strict instructions of the two doctors, who apart from that verified the observation themselves many times unannouced. In the final analysis, the examination confirmed that “in spite of the intense observation ... It was not possible to observe that Therese Neumann who had not been alone for a second, ate anything...” (Gerlich, p. 128 et seqq), cf. Ewald. After this decision of the diocese, only those were admitted to enter the Neumann house, who could show a written permission of the diocese to visit her. However, it was not possible to stop the run even by taking these measures, so that these measures were given up. 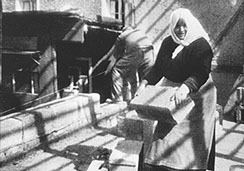 From 1927 on, Therese’s state of health recovered that she was able to work on the field and even help constructing houses as she did in the time before the accidents. 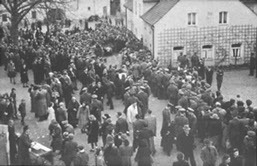 After the end of the Second World War, again a stream of visitors started in Konnersreuth, among others also lots of American soldiers. For many years, numerous visitors received from her help, advice and comfort in their distress. Lots of them rediscovered their faith or were strengthened in it. Nonetheless, Therese never wanted to be in the focus of the public, she did not evade the visitors. However, she harshly rejected sensation-seeking onlookers. For the family Neumann, the rush of visitors meant a considerable stress, especially since it involved numerous limitations in their daily life. Notwithstanding this, she unchangedly continued her modest way of life. 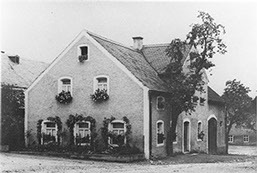 Also the municipality of Konnersreuth remained rural, without making use of the favour of the situation to establish a profitable tourist industry. 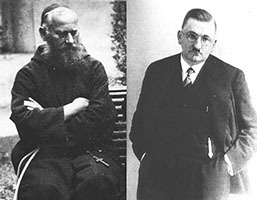 The preoccupation of church professions, mainly of priest and order professions were always a concern of Therese. She learned from the wafers of the Salesians in Eichstätt, that the order was looking for a larger building in order to establish a school for late ordained. When she found out that the castle of Fockenfeld was for sale, she won the order of the Salesians for the idea to establish this school there, insofar it would be possible to provide the financial resources elsewhere. She also achieved this aim with the help of a generous donor. Thus, the order was able to purchase the estate in 1951 and to inaugurate the “School for late ordained St. Josef, secondary school of the wafers of the St. Francis de Sales”. Since then, lots of young men obtained their Baccalaureate and more than 3000 pupils found their way the priesthood. Upon request of Therese a pensioner’s home was annexed to the monastery, in order to also take care of laymen who would participate in the perpetual adoration. Therese died on 18.09.1962, after having suffered from angina pectoris for a long time. Before the funeral on 22.09.1962, four doctors examined the body and confirmed, that it did not show rigor mortis even after four days of public viewing and that it did not emit any corpse scent. The body remained rather movable that some even were afraid of apparent death. The bishop Dr. Graber of Regensburg informed Therese about his wish after his inauguration in 1962, that a monastery of adoration would be founded in the diocese. Therese eagerly ensured that these plans were realised in Konnersreuth. Two families of Konnersreuth donated the estate upon Therese’s demand. She also found unnumerous sponsors for the financing of the building, but she died during the planning phase. However, her concern was rapidly performed after her death. Already on 22.09.1963, the bishop Dr. Graber inaugurated the monastery of adoration of the Sisters of Mary of the Mount Carmel, designated Theresianum, in the presence of thousands of believers.